There is only one true health care public option: Single payer. It covers everyone, all basic health care needs, with doctor of choice. No more premiums, co-pays or deductibles. All health care assets in America would become not-for-profit. The bill already exists. It is HR 676. Congressman John Conyers and I wrote the bill. Our bill has the support of 85 co-sponsors in the House. And it is backed by a growing national movement of labor, doctors, and nurses. The movement needs you. Please join me for tomorrow’s national conference call at 10:00pm EDT. Please call toll-free 1-800-230-1096. The hour has arrived to begin anew the Civil Rights Movement, this time for Health Care for All. I am calling upon you to become a force in this movement. Go to Health Care as A Civil Right at Kucinich.us to learn how you can circulate a single-payer petition and organize in your community. Please help fund this effort. 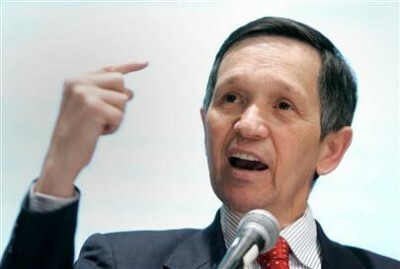 Go to Kucinich.us now, contribute. The Preamble to the United States Constitution and Article One, Section 8 of the U.S. Constitution both describe an originating purpose of our United States: to promote the general welfare. Health care is a legitimate function of our government. Health care is a basic right in a Democratic society. It is no more a privilege based on ability to pay than is the right to vote, which was once accorded only to property owners. Health care is also a moral imperative. Forty seven million Americans are uninsured. Fifty million Americans are underinsured. People are losing their homes, their jobs, their life’s savings, their retirement security and their financial health because they cannot pay medical bills, and despite this calamity Washington looks another way. We must not avert our eyes to this human suffering and this economic injustice. Let’s prepare a response which Washington will long remember as the time when the people reclaimed their government from the insurance and pharmaceutical companies. Join us. Contribute . Together, we can initiate an action plan to intervene and provide health care for all.